For the past twelve years Mrs. Ruhtt Mbumwae has been working to establish Christian schools in several communities near Kalomo. Even now, in 2018, many Zambian children are unable to attend school. Some are turned away because the school near them is full, others are refused because the family is too poor to buy a uniform (required by the Government), but most are uneducated because there is not a school close enough to walk to. In rural Zambia there are neither school busses nor moms with mini-vans! If children live more than 10 kilometers from a school it is unlikely they will attend. It is simply too far to walk each day. Currently, several communities are partnered with ZMF-C to develop schools. These are: Siabalumbi [200 pupils] , Katungu [500 pupils] Butale [250 pupils] and Good Hope Basic School (300 pupils). Additionally, a primary school is growing at Seven Fountains where education is provided for Pre-School thru Grade 3. The first step, before a school is considered, is the establishment of a church. As the church in a community grows and people learn to love one another and work together, the concept of a school can begin. It is much more than bricks and mortar. We work in partnership with these communities and the Ministry of Education to ensure teaching standards, building standards (provided by the Ministry of Education) and community ownership. Physical components: schools in Zambia must have classrooms, offices for administrative staff, houses for teachers, and proper toilets. 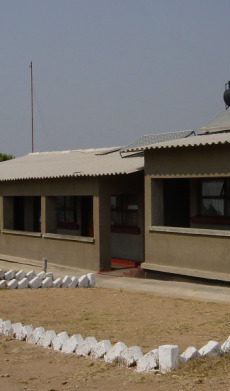 A classroom block has three classrooms, two offices and a verandah. The Ministry of Education provides the plans and materials list. The community provides locally made bricks, sand and rock. ZMF-C provides cement, window and door frames, trusses, roofing sheets and many other building materials. Parents in each community are expected to provide much of the labour. When classroom construction is completed, desks and blackboards which have come on our containers from Canada furnish the classrooms, Zambian text books are purchased from McMillan Publishers in Lusaka, and teachers are hired for each grade. Learning gets underway! For accountability, we have an Education Secretary in place to visit each school regularly to oversee lesson plans and monitor teacher attendance. ZMF-C provides half of the teaching staff at Siabalumbi, Nalabunba and Seven Fountains schools. The Ministry of Education provides the balance. The Christian Community Schools offer Pre-School through to Grade Nine – which is commonly termed a “Full Basic School” in Zambia. Pupils who pass Grade 9 can apply for an academic sponsorship with ZMF-C to help with fees for high school. We are grateful to many donors who have provided funds for construction of these schools, and who provide on-going funds to pay many of the teachers who are working in these schools. The difference it is making in the lives of about a thousand young children is tremendous! !